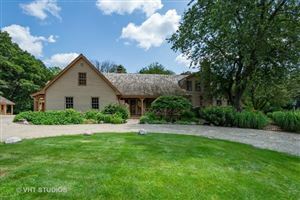 Classic red brick Colonial in premier location in Barrington Hills. Beautiful foyer entrance welcomes you with curving stair case as you enter this magnificent home situated on over 5 acres! This stately home has an ideal floor plan with excellent traffic flow and generous room sizes. 5 bedrooms on second floor with amazing space and hardwood floors throughout. 4.5 total baths means this home can handle large families all year long. A fireplace welcomes you as you enter the gracious living room and dining room; sun room with heated floors adjoins the family room and cook's kitchen overlooking the gardens with gorgeous evergreens and perennials. The in-ground pool with huge patio and built-in grill is ideal for summer entertaining. Finished lower level with rec room, exercise room and tons of storage. Another full bath and kitchenette ideal for long term guests. 3-car attached side load garage, new 5-yr old roof and meticulous maintenance. Come make Moose Hill your home!